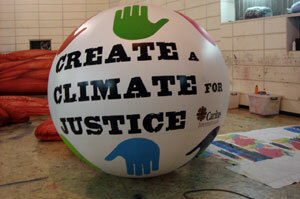 Caritas climate justice campaign baloon in Copenhagen. Caritas demands a fair, effective and binding climate change agreement in Copenhagen. Caritas members from around the world are travelling to Copenhagen to lobby governments at a key climate change meeting. The UN summit (called the UNFCCC) is set to agree targets for cutting the greenhouse gas emissions that cause climate change. Caritas is taking part in the meeting itself and at a number of events in the city aimed at getting a fairer deal for the poor. 19.00 Friday 11 December – all invited to ‘Holy Mass for Climate Justice’ at Sankt Ansgar Cathedral presided over by Caritas Africa President Archbishop Cyprian Lwanga of Kampala (Read his homily). Further information available at www.sanktansgar.dk. 13.00 Saturday 12 December – Caritas representatives will take part in the Planet First, People First walk through Copenhagen. 11.30 Sunday 13 December – Caritas representatives will handover pledges from supporters along with other Churches to the UNFCCC Executive in Radhuspladsen City Hall Square. CIDSE and Caritas Internationalis are calling for a fair, effective and binding agreement in Copenhagen, and say this must be based on a set of essential criteria. Developed countries must commit to at least US $195 billion (€131 billion) additional public financing per year by 2020, using secure and predictable financing mechanisms, to support developing countries to adapt to the impacts of climate change and to develop sustainably. Global commitment to keeping global warming well below 2°C, to emissions peaking between 2013 and 2017, and to achieving a stable level of CO2e concentrations in the atmosphere to 350ppm. Industrialized countries as a group taking a target of more than 40% below 1990 levels by 2020, the vast majority of which should be met through domestic emissions reductions. Copenhagen outcomes must be legally binding and enforceable: a second commitment period of the Kyoto Protocol; and a complementary agreement with comparable action and enforcement for the United States, and action from developing countries. The delegation includes Caritas Internationalis Secretary-General Lesley-Anne Knight. Europe: Caritas Denmark Secretary General Jann Sjursen, Caritas Spain Director Jose Luis Perez Larios, Caritas Europa President Fr Erny Gillen. Africa: Caritas Kenya National Executive Janet Mangera, Caritas South Africa’s Sr Aine Hughes, Bishop Joao Silota from Mozambique, Samuel Mulafulafu of Caritas Zambia, Firmin Adjahossou, SECAM and Archbishop Cyprian Lwanga of Kampala, President of Caritas Africa. Asia: Caritas India’s Sunil Simon, Caritas Bangladesh President Bishop Theotonius Gomes, Caritas Indonesia President Bishop Martinus Dogma Situmorang, Caritas Cambodia’s Executive Director Kim Rattana. Latin America: Caritas Mexico President Bishop Gustavo Rodriguez Vega, Roberto Urbina of Caritas Chile, Manuel de Jesus Moran Hidalgo of Caritas El Salvador, Jose Cervantes Rubio of Caritas Honduras. Oceania: Fr Michael Mackenzie of Kiribati. North America: Walter Grazer of the National Religious Partnership for the Environment.